Ended up back on Cupidstown Hill after taking a diversion so that my daughter could visit it on our way to Kippure. Some work has been done to clean up the area around the gateway to the path leading up to the summit but it looks to be a battle the authorities are struggling to win. No one else around bar a couple of rabbits on the pathway up. 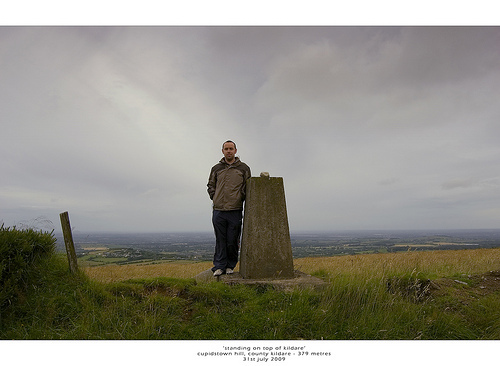 As I stood at the summit, I reckoned I must be in a very small group of people who had gone to the bother to visit it. Small as that group may be, the subset of people who had gone back for second helpings surely must consist of just one. The stretched wire suggested however that some like-minded souls had taken their life in their hands and climbed across the fence dividing the pathway and the trig point that marked the actual summit.